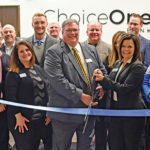 On Saturday, April 14th, Rockford celebrated the Grand Opening and Ribbon Cutting of The Rockford Wedding Studio; A one-stop wedding planning resource center for couples to find vendors. 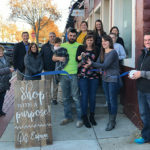 Located at 15 N Main Street in Downtown Rockford, The Rockford Wedding Studio includes owners David and Lisa Hammond of Historia Collective, Kate Rypkema of Future Hair + Beauty Co., and Jenny Carr of Flowery Art. The space includes meeting space to hold consultations, a salon set up and a flower cooler. 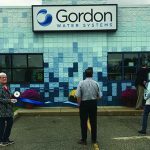 During the event they had a full appetizer and dessert spread, a DJ, giveaways, and a ribbon cutting with the Rockford Chamber of Commerce. Lisa Hammond expressed her gratefulness to her husband, David, along with all the hard work from the other key holders to get the space ready. They are excited to open a space that can help couples plan their wedding in a town they love!